CaSO4 . 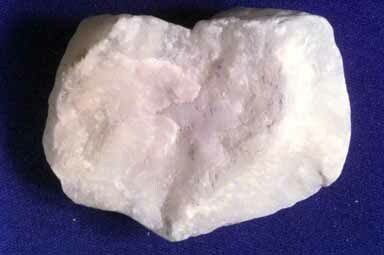 H2O; Hardness 1.5-2; Cleavage perfect one direction, distinct in other two (when visible); white, colorless, gray, yellow, red, brown; Luster pearly on cleavages. .
Alabaster gypsum. Massive variety in which cleavage cannot be seen. Generally identified by hardness. Do not confuse with kaolinite or chalk.